The Assembly Republicans held a closed-door meeting Thursday in which they unanimously decided to replace Mayes with Assemblyman Brian Dahle, a farmer from Lassen County. Dahle voted against the cap-and-trade bill that set off a struggle within the California Republican Party. 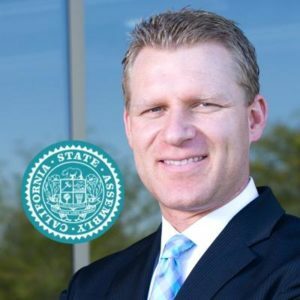 On July 17, eight Republican legislators, including Central Coast Assemblyman Jordan Cunningham, broke rank and voted for a bill extending California’s cap-and-trade program. Launched in 2012, cap-and-trade is a controversial program designed to lower greenhouse gas emissions that requires many industrial companies to obtain permits for emission allowances. Following the vote, anger toward the Republicans who supported the bill erupted at town halls and tea party gatherings. Also, activists accused Mayes of having an affair with former assemblywoman Kristin Olsen, who served as his predecessor as Republican Assembly leader. The allegation was supported by a letter to the Assembly written by Olsen’s estranged husband that requested an investigation into whether Mayes and/or Olsen used state resources to conceal their alleged affair. In addition to anger over the cap-and-trade vote, there had been outcry over Mayes and other Republican legislators being photographed with Gov. Jerry Brown on the day the bill passed. Mayes posed for a photo that day in which he is seen smiling in between Brown and the Democratic leaders of both the Assembly and state Senate. Cunningham, too, was photographed with Brown, but he appeared to be engaged in conversation and was not smiling. Mayes survived multiple challenges to his leadership position until Thursday, when mounting pressure from both activists and the state party resulted in his ouster. The move to oust Mayes is seen as a sign the state Republican Party, which holds little power in California, values principles over pragmatism and bipartisanship. Mayes argued that embracing action on mitigating climate change is needed to help grow the state party, but conservative activists in California remained fiercely opposed to his strategy. Gov. Brown, who relied on Mayes’ support to get the cap-and-trade bill passed, took to Twitter Thursday to criticize the Assembly Republican Caucus. “Sad day when the Grand Old Party punishes a leader whose only flaw was believing in science & cutting regs, costs & taxes for Californians,” Brown said in a tweet. Mayes had served as the Assembly Republicans’ leader since early 2016. He will remain the leader of the caucus through the end of the legislative session in September. In migration during the last 50 years has turned California into a reliable blue state resulting in one of the highest combined tax and regulation burdens in the nation. Electing RINO,s is not the way to bring about change. We need principled men and women to run for office on solid platforms of conservative values who will honor their voters when in office. Our first mission is to break the super majorities in both houses of the Legislature. The second mission is to repeal the “top two” primary election process. We don’t need majorities to influence policy we simply need sufficient numbers to prevent one party rule. We also need to be on top of the redistricting process after the 2020 census. You can be sure that the Dems want to produce districts that will result in super majorities on a permanent basis as far as the eye can see. The Cap and Trade fiasco was a betrayal of all of the voters who voted for the turncoats, that allowed a similar number of Dems to vote No, in exchange for table scraps. Cap and Trade will give us higher taxes and higher costs of necessary Purchased goods baked into our family budgets on a permanent basis. Way to go Mayes and Cunningham see you at the ballot box! Why o why do you run as a Republican and vote with the Democrats? That is why Katcho failed to secure the nomination for Congress. The Democrats seek out weak Republicans. Katcho was a classic: Governor Brown schmoozed him, made him feel important, and could always count on him to be a turncoat and vote with the Democrats: drivers licenses for illegals, higher taxes, etc. Now we have more of the same ilk. If you can’t stand the heat, get outta the kitchen! Let someone else with some backbone lead or at least challenge the status quo, instead of just warming a seat up there and cozying up to people who don’t vote for you. No wonder the Republican party is a minority. Worse than the goofy Democrats are supposed ‘principled conservatives’, who sell us out at every opportunity. I feel betrayed by how Assemblyman Jordan Cunningham portrayed himself, and he doesn’t seem to understand what it is we sent him to Sacramento to do. Assemblyman Cunningham supported a tax hike which we will have to pay. Cunningham’s vote with Democrats on the cap-and-trade fiasco is just one example, and he also voted for special-interests legislation which gives the santa Ynez Indians, Inc. a huge tax break on their property taxes. Guess what? To make up for this giveaway, the rest of us will have to pay MORE in taxes, and Cunningham doesn’t seem to get that we are tired of the baloney. I say we throw people like Chad Mayes and Jordan Cunningham out of office, and restore conservative economic principles to state government. California has already become a one political party State, now the minority parts is homogenizing into being no different than the controlling party!!! Bullet Trains, unfunded pension liability’s, high taxes, welfare, cap & trade and promised free pony’s for all!!! How long before the crash of reality hits!! !